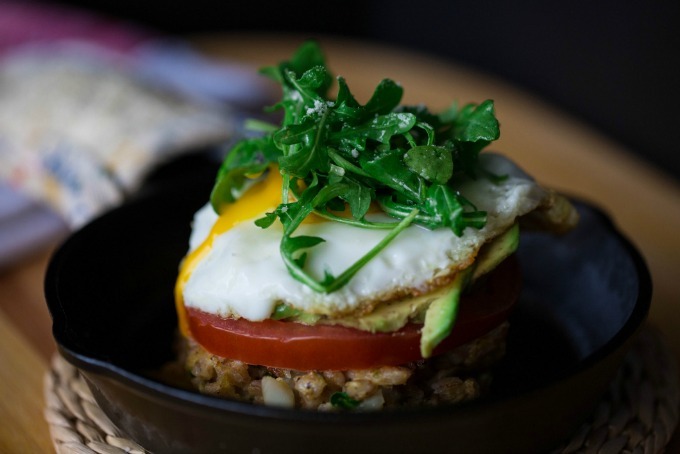 Do you have a typical breakfast you make for yourself everyday? Mine is Oatmeal with blueberries and Vietnamese Cinnamon. No other cinnamon will work. In fact, the blueberries I use are Wild Blueberries from Whole Foods. Believe it or not most of the time I use the frozen berries. Why? Because I get sick and tired of blueberries getting moldy so quickly. This way I never have to worry. 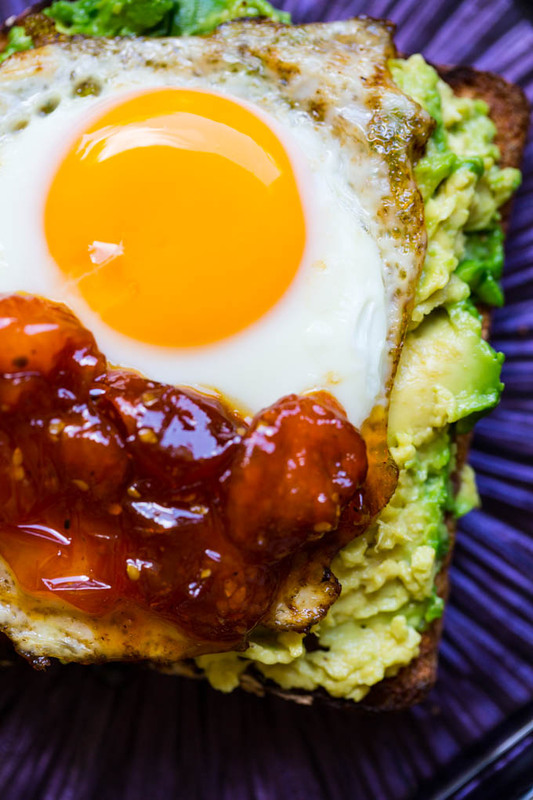 But yesterday, I just didn’t feel like my standard breakfast, so instead I created this Egg on Avocado Toast with Tomato Jam. Was it ever tasty and perfect for Mother’s Day! I’d made some Tomato Jam Tuesday using a container of baby Yellow Tomatoes. I’d had actually purchased them to make another dish but suddenly had the hankering for my Tomato Jam. If you’ve never had Tomato Jam you don’t know what you’re missing! The first time I read about Tomato Jam was years ago and I didn’t think they sounded all the appealing, but forced myself to make some. WOW what a treat! If you like tomatoes and jam, you’ll love this combination for a savory jam. 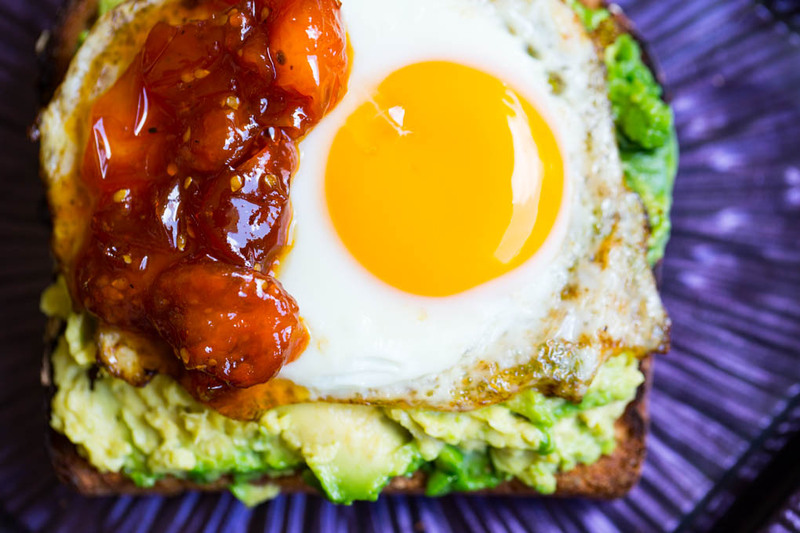 Tomato Jam can be put onto sandwiches, burgers, Egg on Avocado Toast, Crostini with goat cheese, eaten straight from a spoon, or add it to whatever your heart desires. It’s so good, you won’t believe you never tried it before. I had purchased an avocado the other day along with a loaf of bread, a rarity in our house. Bread and chocolate are my downfalls. 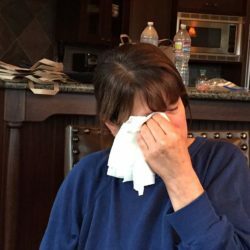 The avocado was starting to feel a bit too ripe and I had two of them on the counter. I decided I’d better indulge in one before it was too late to eat. Everything fit into place so well. 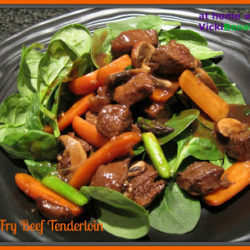 When I came up with this concoction and tried it, I was totally wowed by the flavor. 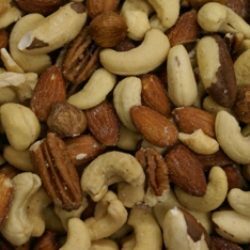 Each ingredient married so well with the other, that I knew this recipe was a winner I needed to share. I’ve made Tomato Jam before but with red tomatoes. I actually think the yellow tomatoes are a bit sweeter while still being savory. I love it, and think you will as well. 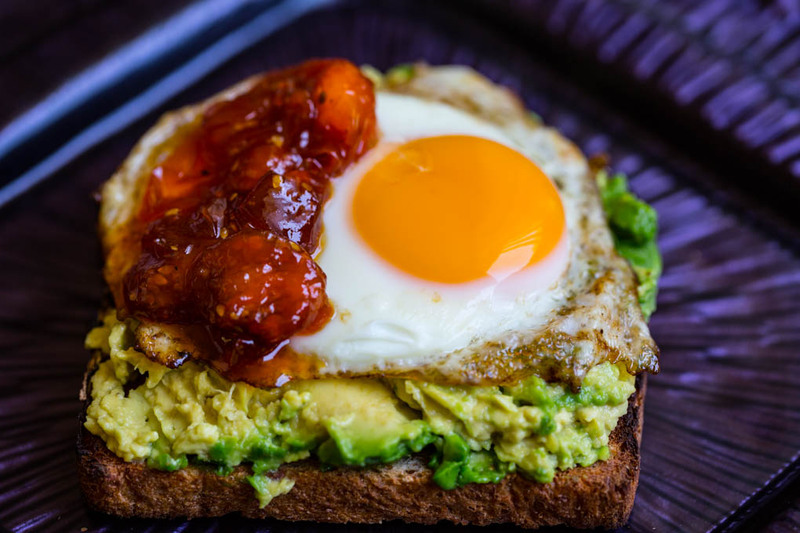 Whether you’re looking for another breakfast alternative, or something new for lunch or dinner, or to serve on Mother’s Day, I hope you’ll give my Egg on Avocado Toast with Tomato Jam a try. Be sure to make a full batch of Tomato Jam because it won’t last long in the house. It’s that good! 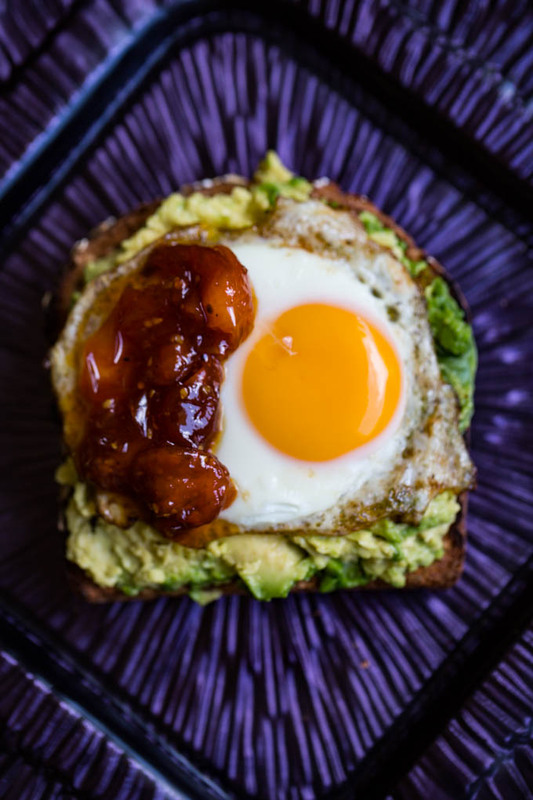 This winning combination of Egg on Avocado Toast with Tomato Jam is sure to become a new household favorite! 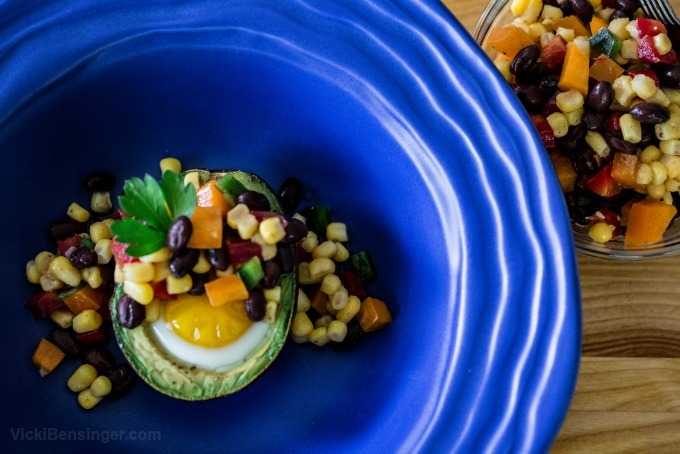 Slice avocado and scoop out each half onto one slice of toast. Then mash. Repeat the same for the other slice of toast. 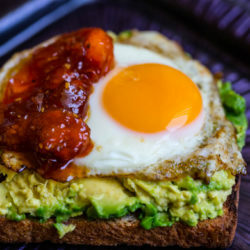 Cook eggs individually - sunny side up and set one on each slice of avocado toast. Spread a tablespoon or more if desired of the tomato jam on one side of egg whites. 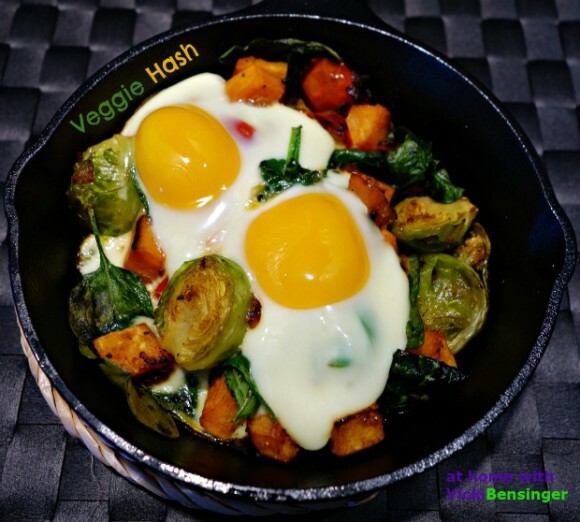 I am drooling terribly…this is such a healthy and heavenly breakfast, Vicki. Love that tomato jam! This looks like such a terrific recipe! 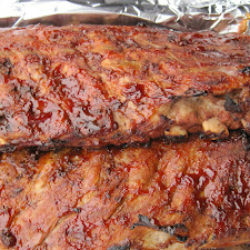 Makes me hungry. 🙂 Good lighting on the 2nd photo, in particular. And good recipe! Thanks so much.